Although I normally eat mono meals, on certain occasions I do make an exception and make a recipe. 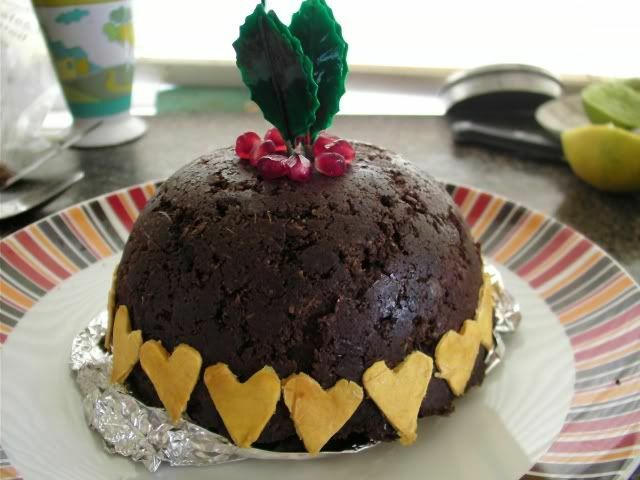 So I would like to share this raw vegan Fruitarian Christmas Pud. I make it for our Christmas dinner, but the recipe can also be used to make smaller individual 'cakes' as shown below. Naturally dried Mango to decorate (optional). 1) Squeeze the Oranges into a large bowl, taking care to remove any seeds. 2) Chop the Dates finely and add to Orange juice. 3) Add the Raisins and Sultanas to the Orange juice. 4) Add the Cinnamon (if using), and stir the mixture. 5) Leave the dried fruit/Orange juice mixture to soak for a couple of hours. 6) Finely grate the shelled Macadamias, then add to the mix and stir again. 7 )Add the Carob, Coconut crunch, and desiccated Coconut, stir again. 8) Using a pestle, mash all the ingredients in the bowl together until the 'cake' has a thick fudge-like consistency. If the mix is too wet, more of the dry ingredients can be added, if too dry add more Orange juice. 9) Place the 'cake' mixture into a bowl, pressing in firmly, leave to chill in the fridge until close to serving. 10) Cut out shapes from the dried Mango, using a small cutter and decorate the 'cake''. Place in fridge until it needs to be served . 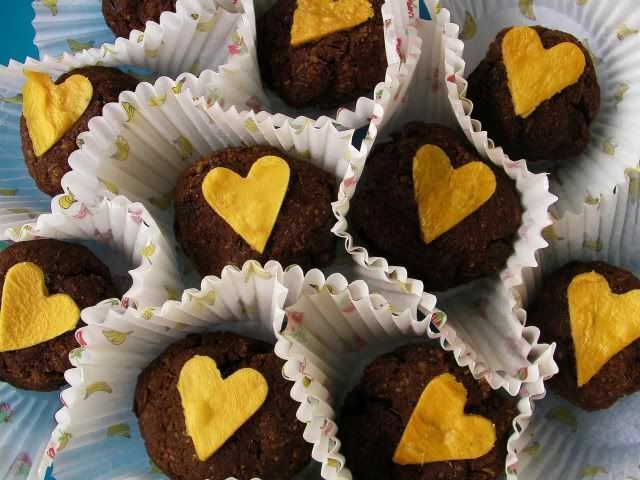 This recipe can also be made into a smaller 'cakes', and served in individual cup cake cases. The 'cake' will keep in an airtight container in the fridge for 2-3 days. To go to Home Page please click here.